I recently attended my medical school class reunion. It was my first time attending, and since it was a “big year” for our class, I figured I should go. I didn’t know what to expect, but it turned out to be a great experience. 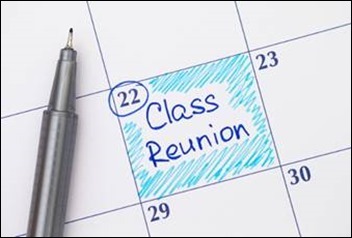 The way our school handles reunions is that it has a major reunion event every year, celebrating the classes every five years starting at the 10-year mark. This year was primarily for the classes of 2009, 2004, 1999, 1994, and so on. Once you hit a certain point (possibly 50 years?) they welcome you at every year. We had about 20% of my class attend, and according to the organizers, that was a pretty good turnout. The festivities started on the hotel shuttle from the airport, where we got to see members of the class of 1969 figure out that they were sitting next to each other and had no idea they were in the same class. Watching their faces light up as they figured it out was hysterical. They immediately started swapping stories about what it was like to be in school 50 years ago. For us relative youngsters, a lot of it was the same, even though times have certainly changed. We had a member of the class of 1954 on the bus. In her class were four women, and she was delighted to learn that our class was the first one to have more women than men (even if it was only “more” by one person.) Doing the math, we figured she had to be close to 90 years old, but you couldn’t tell. She had a walker, but was carrying it folded up rather than using it. From there, it was on to a cocktail reception, where two members of the third-year medical school class plopped down at our table. One of my classmates started probing them on “what is it really like to be a millennial,” which was pretty funny. We learned that most of the class doesn’t actually go to class since all the sessions are preserved on video. Back in our day, we had a “note-taking service” that tape recorded every class. The class then took turns transcribing it and highlighting the key points, leaving you with a great set of notes. Although the new students don’t have to attend class, they miss out on the distillation done by their peers, so I’m not sure they’ve really built a better mousetrap. We must not have scared them too much since they stuck around for most of the reception, although I think they were relieved to not have to attend any other reunion events after that one. The next day was full of continuing education sessions and tours of the medical center, parts of which have become unrecognizable in a research grant-fueled construction boom. The medical library has very few actual printed materials any more, with the stacks having been replaced by individual study spaces and administrative offices. A new computer lab allows for computerized administration of the tests that have to be taken during third-year rotations, and student-focused spaces now include lounge areas, video games, and areas for extracurricular groups to meet. It’s definitely more student friendly, although there should be more student-friendly resources given the more than doubling of the tuition since I graduated. Our tour guide, a fourth-year student who will be graduating soon, seemed surprised by the state of medical education back in our day. We were thrown out into the world to learn our craft on “real patients,” but they have state-of-the-art simulator labs where they are put through a variety of proctored scenarios so they are better prepared for their internships. The latter half of the fourth year provides opportunities to complete life support and trauma certifications, where we had none of that exposure until we walked in the door at our internships. I have to say I was a little envious about the preparation they are receiving, I think it will make internship a lot less shocking. Our guide was surprised to learn that as recently as we had graduated, we were not subject to duty hour limitations. Her eyes were wide at learning how often we took call and for how many weeks of the year. On most of her rotations she didn’t take call, and when she did, it was one day a week and the shift was limited to 18 hours. There were presentations from various medical school leaders, where we learned about upcoming curricular changes that are aimed to better prepare students for the realities of medicine. My school has a strong track record for cranking out researchers and academicians, and I was interested to hear that they’re attacking precision / personalized medicine as a way to reduce costs. I had never really thought about it in the way it was presented, that even with the high cost of some of those treatments, the real savings is in patients you’re actually not treating with standard therapies that might not be effective. It will be interesting to see how that plays out in reality. There were also discussions about whether our school will join the club of schools that are providing full tuition scholarships for the entire student body. Of course the highlight of the reunion was hanging out with classmates and learning what everyone has been up to in the new century. Some are wholly career-focused and driven, others have dropped out of medicine entirely, and there are several of us in-between. As much as physicians tend to talk about the importance of work-life balance, I was surprised to hear one of my classmates make a negative comment about women who had children during their residency training. Instead of celebrating their ability to juggle that level of complexity, he commented “what a strain that must have been on the residency program.” He backtracked a bit when one of the women mentioned that she only took four weeks off after childbirth, because that was the amount of vacation allotted to all residents each year and she didn’t strain the system any more than her counterparts who went to the beach. Based on our interactions with current students, I suspect there is going to be a lot more tolerance for work-life balance concerns. There may be a steeper learning curve in residency due to the changes in work hour restrictions as students are exposed to scenarios they haven’t seen before because they simply weren’t in the hospital overnight. On the other hand, they may learn faster or better because their brains won’t be mush from working hellish schedules. I had the privilege of talking with a 90-year-old urologist and getting his thoughts on how things have changed over time. Based on his family history and state of health, the odds are good that I’ll be seeing him again in five years. Have you ever attended a class reunion? Would you do it again? Leave a comment or email me.